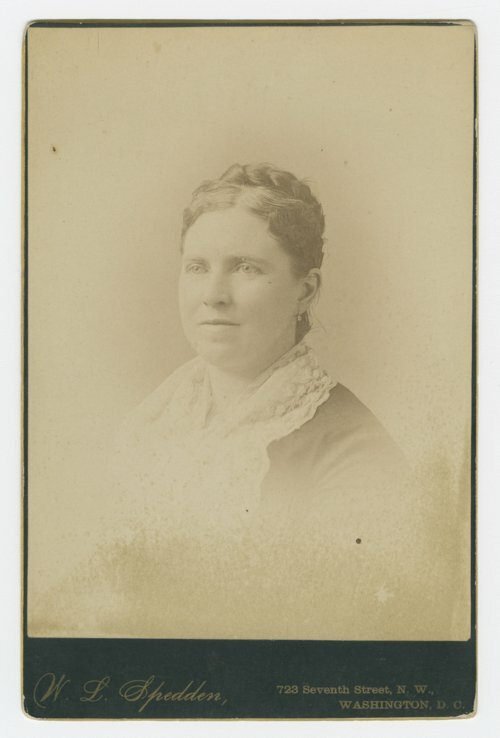 This is a cabinet card showing Fanny Kelly, who left Kansas with her family for Idaho in the summer of 1864. Their wagon train was attacked by Sioux Indians and Fanny Kelly, her niece Mary Kelly, Sarah Larimer and her son were captured and three men were killed. Sarah Larimer, her son, and Mary Kelly were able to escape; however, Mary was killed. Fanny spent nine months among the Sioux until her release at Fort Sully. She was reunited with her husband Josiah and they returned to Kansas. Josiah later died of cholera and she remarried William F. Gordon and lived in Washington, D.C. until her death on November 15, 1904.